[Paths,Times,Z] = simByEuler(MDL,NPeriods) simulates NTRIALS sample paths of NVARS correlated state variables driven by NBROWNS Brownian motion sources of risk over NPERIODS consecutive observation periods. simByEuler uses the Euler approach to approximate continuous-time stochastic processes. [Paths,Times,Z] = simByEuler(___,Name,Value) specifies options using one or more name-value pair arguments in addition to the input arguments in the previous syntax. where D is a diagonal matrix whose elements are the square root of the corresponding element of the state vector. Create a cir object to represent the model: dXt=0.2(0.1-Xt)dt+0.05Xt12dW. Simulate a single path over a year using simByEuler. 'basic' (default) | character vector with values'basic', 'absorption', 'reflection', 'partial-truncation', 'full-truncation', or 'higham-mao' | string with values "basic", "absorption", "reflection", "partial-truncation", "full-truncation", or "higham-mao"
Method to handle negative values, specified as the comma-separated pair consisting of 'Method' and a character vector or string with a supported value. The Method argument is only supported when using a CIR object. For more information on creating a CIR object, see cir. The simByEuler function partitions each time increment dt into NSteps subintervals of length dt/NSteps, and refines the simulation by evaluating the simulated state vector at NSteps − 1 intermediate points. Although simByEuler does not report the output state vector at these intermediate points, the refinement improves accuracy by allowing the simulation to more closely approximate the underlying continuous-time process. Flag indicates whether simByEuler uses antithetic sampling to generate the Gaussian random variates that drive the Brownian motion vector (Wiener processes). This argument is specified as the comma-separated pair consisting of 'Antithetic' and a scalar logical flag with a value of True or False. If you specify an input noise process (see Z), simByEuler ignores the value of Antithetic. Direct specification of the dependent random noise process used to generate the Brownian motion vector (Wiener process) that drives the simulation. This argument is specified as the comma-separated pair consisting of 'Z' and a function or as an (NPERIODS ⨉ NSTEPS)-by-NBROWNS-by-NTRIALS three-dimensional array of dependent random variates. If StorePaths is True (the default value) or is unspecified, simByEuler returns Paths as a three-dimensional time series array. If StorePaths is False (logical 0), simByEuler returns the Paths output array as an empty matrix. The simByEuler function runs processing functions at each interpolation time. They must accept the current interpolation time t, and the current state vector Xt, and return a state vector that may be an adjustment to the input state. If you specify more than one processing function, simByEuler invokes the functions in the order in which they appear in the cell array. You can use this argument to specify boundary conditions, prevent negative prices, accumulate statistics, plot graphs, and more. For a given trial, each row of Paths is the transpose of the state vector Xt at time t. When the input flag StorePaths = False, simByEuler returns Paths as an empty matrix. Dependent random variates used to generate the Brownian motion vector (Wiener processes) that drive the simulation, returned as a (NPERIODS ⨉ NSTEPS)-by-NBROWNS-by-NTRIALS three-dimensional time series array. simByEuler simulates NTRIALS sample paths of NVARS correlated state variables driven by NBROWNS Brownian motion sources of risk over NPERIODS consecutive observation periods, using the Euler approach to approximate continuous-time stochastic processes. This simulation engine provides a discrete-time approximation of the underlying generalized continuous-time process. The simulation is derived directly from the stochastic differential equation of motion. Thus, the discrete-time process approaches the true continuous-time process only as DeltaTime approaches zero. The input argument Z allows you to directly specify the noise-generation process. This process takes precedence over the Correlation parameter of the sde object and the value of the Antithetic input flag. If you do not specify a value for Z, simByEuler generates correlated Gaussian variates, with or without antithetic sampling as requested. The end-of-period Processes argument allows you to terminate a given trial early. At the end of each time step, simByEuler tests the state vector Xt for an all-NaN condition. Thus, to signal an early termination of a given trial, all elements of the state vector Xt must be NaN. This test enables a user-defined Processes function to signal early termination of a trial, and offers significant performance benefits in some situations (for example, pricing down-and-out barrier options). Deelstra, G. and F. Delbaen. 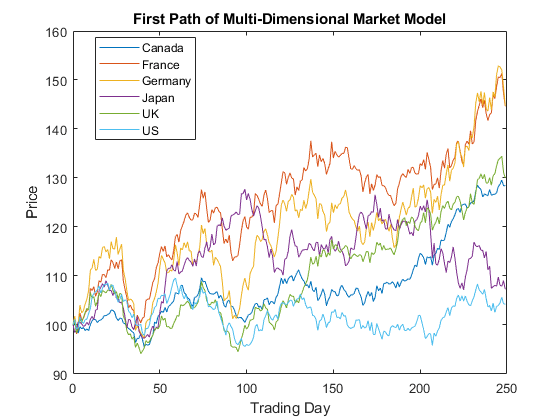 “Convergence of discretized stochastic (interest rate) processes with stochastic drift term.” Applied Stochastic Models and Data Analysis., 1998, Vol. 14, Number 1, pp. 77–84. Higham, D. and X. Mao. “Convergence of Monte Carlo simulations involving the mean-reverting square root process.” Journal of Computational Finance., 2005, Vol. 8, Number 3, pp. 35–61. Lord, R., R. Koekkoek, and D. Van Dijk. “A comparison of biased simulation schemes for stochastic volatility models.” Quantitative Finance., 2010, Vol. 10, Number 2, pp. 177–194.